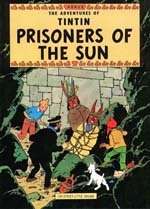 In the original Hergé comics, "Prisoners of the Sun" is the second book of a two-part story that follows "The Seven Crystal Balls". It is almost certain that the script will include both parts, retaining the title of the latter. (Much like the first film, which adapts both Hergé’s "The Secret of the Unicorn" and "Red Rackham’s Treasure", using the title of the former). "The Seven Crystal Balls" was originally published in 1943 as a serialized newspaper adventure. The storyline has Tintin and his friends embarking on an adventure to Peru after a mysterious illness is found to be connected with a Mummy’s curse. Horowitz notes that production on the sequel depends entirely on how well the first film does, but the current plan is to have Jackson direct Prisoners, Spielberg having directed Unicorn. The selection of storyline shouldn’t come as a huge surprise to fans, as there are very few Tintin adventures that span multiple books (the only other one left that includes all the characters is the science fiction adventure "Destination Moon" and "Explorers on the Moon"). "I’ve got several favorite stories," he said, "I like ‘Seven Crystal Balls’ and ‘Prisoners of the Sun.’ I like ‘The Black Island.’ I like ‘The Calculus Affair’…the moon one[s] would be great to do as a third or fourth one." The Adventures of Tintin: Secret of the Unicorn hits theaters in 2D, 3D and IMAX 3D on December 23, 2011.